And it’s true, I mostly wear pretty but unfashionable dresses and skirts. Pretty clothes are one thing, but fashion, constantly changing clothes and adornments that send messages about class, taste and individuality, that’s a whole different animal. To me, style is like a language where my mastery is limited to asking “Is this vegetarian?” and “Where is the bathroom?” So for this particular project I’ll start with something I can get into: prom dresses. After all, it looks like your average prom dress is as far removed from catwalks and Vogue as I am. Now, looking through prom dresses, they don’t seem too different from the kinds that were around when I was in high school — except that the pick-up skirt is a new one on me. I can see it as a design element, part of a well-balanced dress, but the full pick-up skirt that looks like a poofy, sloppy, satin pineapple? Let’s just say I think the pick-up skirt ought to get off of my darn lawn. I can sort of understand the appeal on an intellectual level, I didn’t mind this one, but it just seems that the line between “opulent and romantic” and “sloppy trainwreck” is just so easily crossed. Well, the children of 2030 need something to laugh at, I guess. Aside from that, it seems like the ball gown skirt is out, sleeves of any sort are out, fussy (aside from those pick-up skirts) is out, and a more classical look – albeit one dressed up with sparkles and pretty designs – is in. Here’s my take on one — and yes, the white paint pen is definitely a new toy. I didn’t end up going to prom (graduated before the year was over, it’s a long story — although I doubt I could have talked my husband, then my boyfriend, into it anyways) but for those of you who did, what kind of dress did you have? I love simple dresses like that! Absolutely gorgeous! Back in the dark ages of 1978, I wanted to borrow my best friend’s dress (plain, simple) which wouldn’t have cost anything, and I thought my frugal mom would be happy about that. But she thought it was “too slinky” so she shelled out for something in muslin with a tiered skirt.. I like this purple one much better. I just found your blog and I love it! I’ve collected paper dolls for years! Don’t feel bad about never going to prom… I went to 3, each time thinking it would be better. The dresses were fun though. I had a strapless iridescent red one with hand beading all over, a teal and black empire waist one with a sheer black beaded overlay, and a satiny dark purple halter ballgown with embroidery on the top. I prefer to forget that I even WENT to my prom, so I shan’t answer that question. Prom was a god awful mistake XD My dress was pink and looked almost exactly like the “opulent and romantic” one you picked out. Except pink. But my dress ended up being the best part of prom T.T Limo broke down, music sucked, food sucked, building sucked (OMG wayyyy to many stairs and those suckers are hard to climb in them heavy ballgowns and heels). If I could do it again, I’d have stayed home. I’m in NZ, so ball dress styles are a bit different to ones that seem to be popular over there! I love your designs, I think they are fab! 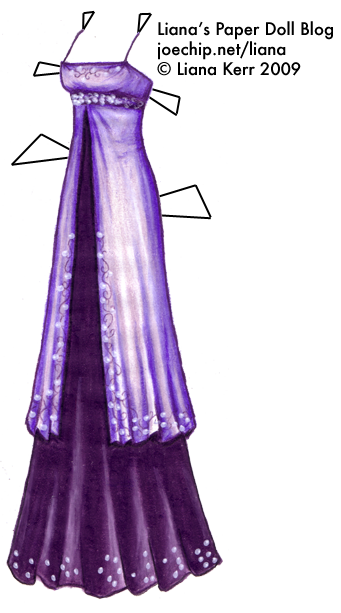 And this dress in particular is lovely, I love purple, and the style is very feminine and pretty. well i’m going to prom this year and the link below shows my dress. Ooh, I like that — very romantic! i loved my prom dress!! i helped design it and it’s the only formal dress i own and i use it every time i can…which has been only two. I have no idea how to describe it except that it was copper-orange, halter, and backless except for beaded straps that hold the dress together. your’s is beautiful and i hope to see more! Back in 1986, I had an electric blue sequin gown, body hugging, slit skirt, with one bare shoulder, and a pom bow on the other shoulder. In 85 I had a striped cream and maroom princess bodice dress, with puff sleeves, almost off the shoulders, low neck line, full skirt. I would have loved to wear this purple dress. It reminds me The Titanic evening gowns that Kate Winslett wore. Too bad that I went with boyfriends I had dated most of the year, and we at the end of the romance, so there was no spark or magic. Wow! My sister wore a prom dress almost identical to that one only it was a deep wine red color instead of purple. (She believes all things purple are evil)But it’s amazing to see how very similar your dress and her dress are! its so cool i love the color purple! i wish i could have ccome up with that.